The 22nd annual Screen Actors Guild Awards were broadcast last night on TNT from the Shrine Auditorium in Los Angeles. Tambay A. Obenson of Shadow and Act reports Golden Globe winning actor Idris Elba made history by becoming the first male actor to win in two categories for individual performances in the same year: Outstanding Performance by a Male Actor in a Supporting Role for ‘Beasts of No Nation,’ and Outstanding Performance by a Male Actor in a Television Movie or Miniseries for ‘Luther.’ During his acceptance speech, Elba stated, “Welcome to Diversity TV,” identifying television as a space for diverse casting, content and recognition. Other winners include Queen Latifah who won for Outstanding Performance by a Female Actor in a Television Movie or Miniseries for her role as Bessie Smith in “Bessie” (her third SAG win); Viola Davis won Outstanding Performance by a Female Actor in a Drama Series for her role as Annalise Keating in ‘How to Get Away With Murder’ (her second win in a role for the same role; her third win in total); and Uzo Aduba for Outstanding Performance by a Female Actor in a Comedy Series for her portrayal of Suzanne “Crazy Eyes” Warren in “Orange Is the New Black” (her second win). 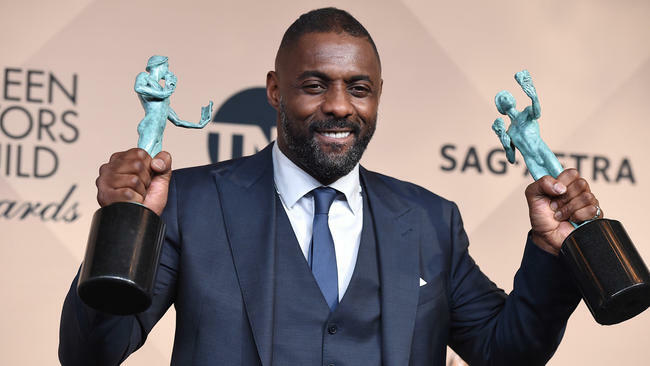 For more information about Elba and the SAG Awards, visit Shadow and Act. Like The Burton Wire on Instagram or Twitter @TheBurtonWire.